ISAIAH THOMAS YELLED out, and then he disappeared among the bodies. The 5-foot-9 Boston Celtics point guard had just collided in midair with Karl-Anthony Towns, one of four Minnesota Timberwolves defenders who had contested Thomas' layup early in the third quarter of their March 15 matchup. For a moment, Thomas couldn't be seen on the telecast, eclipsed by the swarm of Towns, Andrew Wiggins, Brandon Rush and Gorgui Dieng. As the layup fell wayside without a referee's whistle, Thomas tumbled to the TD Garden floor and ended up facedown, inches from the feet of a seated cameraman. Then Towns, the largest man on the court, lost his balance and collapsed onto Thomas' back, pressing the point guard's body even farther into the hardwood. This is when it happened, according to the Celtics organization, the moment that Thomas suffered the injury that would be aggravated and reaggravated over the next few months -- and would later hang up a blockbuster trade with the rival Cavaliers. At the time, the injury didn't seem to bother Thomas, who kept playing without any hint of a limp. Then, with less than a minute left in the third quarter, Thomas walked gingerly to the sidelines and sat on the bench clutching his right knee with both hands. Immediately after the game, nothing was mentioned about a hip injury. The following afternoon, the Celtics announced on Twitter: "Isaiah Thomas will not travel this weekend to NY and Philly. He's out with a right knee bone bruise." The next day, Celtics coach Brad Stevens reiterated to reporters that Thomas had suffered a knee injury, with no mention of a hip tear. "You could see him favoring [the knee] a little bit at that time," Stevens said. "He felt OK through the rest of the game. It was really hurting and swelled up [Thursday] night, and so we're hopeful to have him back after the trip. Those bone bruises are a little bit unpredictable." After two games on the sidelines with what the team called a knee injury, Thomas returned to the court and averaged 27.8 points per game for the rest of the regular season, leading the Celtics to the Eastern Conference's No. 1 seed for the first time since the 2007-08 championship campaign. What followed during Thomas' playoff run may have been one of the most emotionally and physically damaging postseasons in recent memory. The day before Game 1 of the Celtics' first-round matchup against the Chicago Bulls, Thomas learned his younger sister had died in a car accident in Washington. In Game 1 against the Washington Wizards in the conference semifinals, Thomas lost a front tooth following an inadvertent elbow from Otto Porter, requiring surgery to replace it and fix two other shifted teeth. He played through the dental wreck and scored 33 points and notched nine assists in the win. He didn't miss a game. "The Boston Celtics today announced that Isaiah Thomas will miss the remainder of this year's postseason following re-aggravation of a right femoral-acetabular impingement with labral tear during Game 2 of the Eastern Conference Finals against Cleveland. Thomas initially injured the hip during the third quarter of the Celtics' March 15 game against Minnesota, forcing him to miss the next two regular season contests. The injury was further aggravated during Game 6 of the Eastern Conference Semifinals at Washington on May 12." It was the first time the team had publicly acknowledged any sort of hip tear -- the team now blaming his two-game absence in March on the labral tear, not the right knee bone bruise that was the team's official diagnosis in March. While the Celtics had publicized Kelly Olynyk's and Avery Bradley's hip injuries during the playoffs, Thomas' far more serious labrum tear had not been made public until it ended his season. It was also, in retrospect, a hint that not everything about this injury was, perhaps, as it seemed. After consultation with specialists and team doctors, Thomas, who declined to comment for this story, decided not to undergo surgery on his labral tear, instead focusing on rest and rehabilitation over the summer. Then, in July, in a shocking development for longtime Celtics fans, the team parted ways with both head athletic trainer Ed Lacerte and strength and conditioning coach Bryan Doo, a pair of staffers who combined had spent more than four decades with the team. 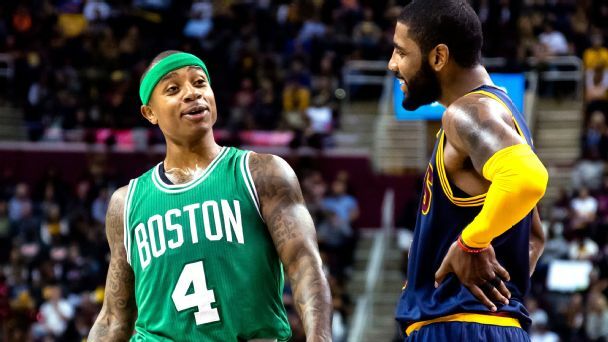 Last week, an even bigger stunner: The Celtics traded Thomas to Cleveland in the summer's biggest blockbuster trade. HERE'S A FUNNY thing about hip labrum tears: Some people can't even feel it when they rip. Labrums are made of cartilage, which doesn't have nerves to signal when something's wrong. What people can feel are the bones of the hip's ball-and-socket joint grinding against each other once the labrum -- the joint's cushioning tissue -- begins to fray. All of which is what makes Thomas' condition so tricky to diagnose -- and raises questions about when, in fact, he first injured himself. It's possible it happened as far back as December. In laymen's terms, an FAI is when the head of the femur (the ball) and the acetabulum (the socket) rub together (impinge) when they shouldn't. The labrum, when healthy, keeps the socket stabilized when asked to rotate and push in different directions. The 28-year-old Thomas, at 5-foot-9, needs all the agility and stability he can muster to maneuver around defenders like a crab equipped with nitro-boosters. In late May, Thomas revealed to ESPN's Chris Forsberg that doctors have known for some time his hip bones are not normal. "Like I have an extra bone or something, like doctor talk," Thomas said. "I don't understand what they're saying." Impingement often occurs because of extra bone matter that makes the ball-and-socket fit together improperly. FAI can become severely painful, especially in the groin, and limit motion. "Most people with hip impingement experience pain in the groin area during or after flexing the hip, as when running, jumping or sitting for a long time," says a Mayo Clinic explainer. Because of its close proximity to the groin, an FAI has been mistaken for groin muscle problems in athletes for decades, according to Dr. Marc Philippon of the Steadman Clinic in Vail, Colorado. Since 2010, there have been 13 documented surgeries to repair torn labrums in the hips of NBA players, often dealing with an FAI. Nine of those 13 surgeries were performed by Philippon, according to ESPN.com research. "In the past, sometimes they called it a groin pull and they thought it would get better just with time," Philippon told ESPN.com. "But in reality some of these groin pulls are the result of something wrong inside the joint. That's why it's coming to our attention more." Philippon has not seen Thomas' hip. He has read only the media reports about Thomas' condition. But he has performed labral tear arthroscopic surgeries on LaMarcus Aldridge in 2005 and in 2012 as well as on Alex Rodriguez in 2009. He also did the surgery for Jonny Flynn back in 2010 and three of Gerald Henderson's hip surgeries (Henderson is currently rehabbing his hips this offseason and remains unsigned). The 6-foot Flynn, a smaller point guard like Thomas, had surgery in July 2010 after his rookie season. The former No. 6 overall pick played his final NBA game a week after his 23rd birthday in 2012. Martell Webster battled an assortment of back injuries before he tore his hip labrum -- he even tried prescription glasses on the court to alter his perception and rebalance his posture to relieve pain from his bad hip. Ultimately, Webster underwent surgery in November 2015 to repair a partial tear in his right hip labrum. Twenty-one months have passed and the 30-year-old hasn't been signed since. NOT EVERY LABRAL tear is career threatening, and athletes respond differently to the surgery. Aldridge is a success story -- of sorts. During his freshman season at Texas in 2004-05, Aldridge had surgery to repair a tear in his left hip. He then needed a second procedure in April 2012 on his other hip. After an offseason of rehabbing post-surgery, Aldridge returned the following October in time to average 21.1 points and 9.1 rebounds in an All-Star campaign. After two hip surgeries, Aldridge remains a top big man in the game. But if Thomas were to choose to go under the knife, the timetable may not be ideal for the Cavs. The average recovery time after a labral repair surgery is just more than six months. Such a time frame would put Thomas back on the court in mid-March if he received surgery tomorrow. But recoveries from surgery have lasted as long as 10 months, as was the case with Wilson Chandler in 2015 (his second labral tear repair in a four-year span). Each day that Thomas delays could make the situation worse. For a 32-year-old LeBron James hell-bent on dethroning the Golden State Warriors -- and doing so without the help of Kyrie Irving -- this is not a workable situation. Both the Cavaliers and Celtics declined to comment for this story. There is some evidence that suggests when it comes to surgery, the sooner, the better. According to a recent study by the Steadman Clinic in the American Journal of Sports Medicine, athletes who had longer post-surgery careers tended to have a shorter duration of symptoms prior to going under the knife. In other words: Don't delay if you can help it. In addition to Philippon, three other surgeons -- Dr. Thomas Byrd of the Nashville Hip Institute, Dr. Bryan Kelly of the Hospital of Special Surgery in New York, and Dr. Carlos Guanche of the Southern California Orthopedic Institute -- have performed arthroscopic surgery on NBA players to fix labral tears. Byrd declined comment for this story, citing his active consultation with Thomas. In New York, Kelly has also been working with Thomas during his recovery, according to a report by ESPN's Adrian Wojnarowski. "I haven't had one doctor tell me that this injury is going to hurt my career," Thomas told Wojnarowski last week. "Surgery was not the best option in this case. I aggravated it in March when Karl-Anthony Towns fell on me. I kept playing on it and making it worse -- until I couldn't play anymore last season." Philippon says there are a multitude of factors to consider when outlining a timetable for a return to play. The most predictive one: the damage of cartilage in the hip, which, in Thomas' case, is publicly unknown. But it can be worse for certain types of athletes. Philippon's research among NFL players indicates that linemen have a more difficult time recovering from hip labrum tears. Why? Because linemen literally crouch and flex their hips for a living, which exacerbates the problem. One sports physician told ESPN.com that hip problems for guards are particularly worrisome because of their defensive crouching position as well as the intense agility demands of the position. Another key factor for hip labrum recovery is whether there was trauma to the hip joint (a fall or collision or awkward landing) that caused the pain. With Thomas, the Celtics have pointed to the March 15 trauma when Towns fell on Thomas, who was already dealing with a hip bone abnormality. Philippon says it's not unheard of for a player to opt for the nonsurgical route, as Thomas did. But that depends on the damage in the cartilage. "If you have a patient who has an acute injury and has cartilage damage, I find it's better to intervene earlier than later," Philippon says, "because the longer you wait with these injuries, that tends to lead to more problems." Players have put off surgery before and found success, but real-life examples are hard to come by because of confidentiality agreements with doctors and patients. Philippon says "a lot of players" come to see him for a hip tear but they don't fix it surgically, and no one hears about it. Intangibles like contract status and competition for playing time can make surgery decisions difficult for players who could be in line for a big payday if they can string together a few months of high-level play. Inevitably, players ahead of a contract year may opt to avoid surgery and tough it out. But the hip can only put up with so much. "If it's a contract year, I understand that," Philippon says. "But if you play with a bad hip and you end up having a bigger problem, I'm not sure how good the contract is going to be." Thomas is set to be a free agent next summer, and hasn't exactly been shy about it. "They better bring out the Brinks truck," Thomas told CSNNE.com in July 2016 in reference to the Celtics. "They're paying everybody else. I gotta get something." Thomas doubled down on that sentiment in July, posting on social media this photo of custom sandals at his feet with a Brink's truck depicted on one and a pile of money printed on the other. The message overlaying the sandals read: "That SLOW grind!" Less than one month later, the Celtics traded Thomas to their biggest rival. THE MARCH 15 game -- when Thomas was originally injured, according to the Celtics -- wasn't the only time Thomas suffered an injury this past season. After playing 103 consecutive regular-season games with the Celtics, Thomas was hurt in a Dec. 5 matchup against the Rockets -- an event that has become interesting in the context of his current injury status. With 57 seconds left before halftime, and the Rockets leading by nine, James Harden passed the ball up the floor to a streaking Eric Gordon, who was being chased by Thomas like a cornerback covering a slant route. As the ball approached Gordon's hands, Thomas leapt up from a dead sprint and batted the ball away while twisting in the air, coming down hard on his right foot. After an awkward backpedal, Thomas immediately grabbed the top of his right leg as the play went the other way. The Celtics commentators on the telecast immediately took note of the gimpy guard. "That's not good," Brian Scalabrine said. "He made a big-time play on the ball, but those are the ones that scare you." Thomas kept playing. Two trips later, he pulled up from beyond the arc and drained a quick 3-pointer on the move. "I guess he's OK," Scalabrine said. "Anytime a guy grabs his leg after a non-contact play I get nervous." The day after that game, in the middle of a road trip, Thomas flew back to Boston to receive treatment on what the team called a groin strain. He missed Wednesday's game in Orlando, and on Thursday, Celtics president of basketball operations Danny Ainge told local radio that Thomas had received a platelet-rich plasma injection in his upper thigh in the hopes that it would help it heal faster. "It's eating me alive to not be able to participate, not to be able to play, but I gotta be smart about this because I don't want this to linger on for the rest of the season," Thomas told reporters at the time. After 10 days off and four missed games, Thomas returned on Dec. 16 against the Hornets, launching a 10-game stretch in which he averaged 31.5 points per game. About four months later, the Celtics say he tore the labrum in his hip, in the same right leg that required that PRP injection for what was officially listed as a groin strain. So was Thomas' injury in December actually when he initially tore his labrum? "Very likely," says Guanche, who has performed more than 3,000 labral-tear repairs in his 20-year clinical career. "I wish I had a dollar for every patient that has told me, 'I've been treated for a groin strain for the last X days, weeks, months, year or whatever,' and it turns out to be a labral tear." Team sources maintain that Lacerte's dismissal was not related to the team's handling of Thomas' hip injury and that a plan to revamp their sports science and training staff was established well before Thomas' injury. Still, the sequence of events raised enough questions for the Cavs to hit pause on trade talks last week, eventually netting them an extra pick (a future second-rounder) in the deal. The Celtics were either not aware of or had not disclosed Thomas' injury for months, fired the team's trainer, and then traded Thomas. Though Thomas' hip condition was only made public in May, league sources told ESPN.com that the Celtics organization was not certain exactly when the labral tear occurred. The Towns collision on March 15 was one possible aggravation point, but the initial timing of the tear remains unclear. Given the circumstances, Guanche says he was surprised to see that Thomas had opted to forgo surgery in May. "That would have been the time to get it fixed," Guanche says. "It was a gamble." Meanwhile, back in Cleveland, the Cavs remain in a wait-and-see mode with Thomas, who has yet to be introduced with his new team. Cleveland is, once again, in the hunt for a championship, but it remains to be seen whether Thomas can be healthy enough to be a part of that quest. Of the 13 recent hip labrum surgeries, none were performed on a player of Thomas' stature. None were on an MVP candidate joining a title-contending team. It's all uncharted territory. What is certain, though, is that torn hip labrums are at times imperceptible, often hideable, easily misdiagnosed and often overlooked -- and have shortened careers, or claimed them.